Located in Walla Walla, Charles Smith opened his first winery, K Vintners. His first release, K Syrah, initiated the style of winemaking that Charles continues today: small lots of single vineyard Syrahs and field blends of Syrah, Cabernet Sauvignon, Grenache, Tempranillo, and Viognier, all of which are hand-picked, fermented with naturally occurring yeasts and basket pressed. In 2008, his K Vintners was recognized by Wine & Spirits magazine as one of the “Best New Wineries of the Last Ten Years,” and as “Winery of the Year” in the annual wine buying guide. His wines continue to receive recognition from wine publications such as Wine Advocate, Wine Spectator, Wine Enthusiast, and Wine & Spirits with 98 scores of 95 points and above, and 386 scores of 90 points and above. Winemaker Charles Smith is the only person to have received Winemaker of the Year distinctions by both Wine Enthusiast (2014) and Food & Wine (2009). Growing up just outside of Sacramento, California, Charles Smith began craving worldly travel at a young age. In 1989 Charles decided to move to Denmark and spent nine years managing rock bands and concert tours throughout Europe. Wining and dining on the road ultimately triggered the career he has today.In 1999, he moved back to the States, landing in the Pacific Northwest. He opened up a wine shop on Bainbridge Island, just across the Puget Sound from downtown Seattle. On a road trip, he passed through the small town of Walla Walla and met a French winemaker. The two men discovered their common passion for great Syrah and Charles was convinced to move to Walla Walla and make his own juice. December 2001, Charles released his first wine, 330 cases of the 1999 K Syrah. The Walla Walla Valley was now his home. In 2017, he unveiled a new name for his international company and vast portfolio – Wines of Substance. SIXTO: The Chardonnay-only label from Charles Smith and Brennon Leighton. Inspired by the story of musician Sixto Rodriguez, Charles similarly wanted to resurrect something that was always great, but was waiting to be rediscovered – as in the old Chardonnay vines in Washington State. Being the sixth label that Charles created (sextus translates to “sixth” in Latin), the name SIXTO was a perfect fit. SUBSTANCE: The newest chapter in history books of Charles Smith and his wines. With a single-minded vision to produce the best value-priced Cabernet Sauvignon, Substance label was born. Using traditional winemaking, natural fermentations and barrel-aging, each wine is made in small batches ensuring integrity. ViNO CASASMITH: Italian inspired and locally produced, ViNO was created by Charles Smith in 2010 with the inaugural release of a 100% Pinot Grigio. This is in keeping with the vision of producing Italian varietals with the same integrity as they would be produced in Italy. Hand-made wines that are a great value and delicious to drink. Taste, Learn and Enjoy® with us! RSVP for at your local WineStyles location. Please join us, as we Taste, Learn and Enjoy these ‘rockin’ wines from Cliff Lede Vineyards, Napa Valley. RSVP at your local WineStyles location. In 2005, a state of the art, 25,000 square foot winery and cave system was etched into a hillside overlooking the estate vineyards. Not only did Cliff create a beautiful property, he also assembled an unrivaled team that shares his passion for quality. Today, Winemaker Christopher Tynan crafts Cabernet Sauvignon and Sauvignon Blanc, with the flagship, Poetry Cabernet Sauvignon, sourced from the steep eastern hillside portion of the estate. In 2015, Cliff Lede vineyards were awarded with a Napa Green certification which focuses on farming and production methods that meet and exceed more than twenty local, state, and federal “best practices.” Cliff Lede wines are an exuberant expression of Napa Valley vineyards and reflect the natural harmony and balance of sustained vineyard management. Breggo Cellars was renamed FEL Wines as an homage to Cliff’s mother Florence Elsie Lede, who dabbled in home winemaking. 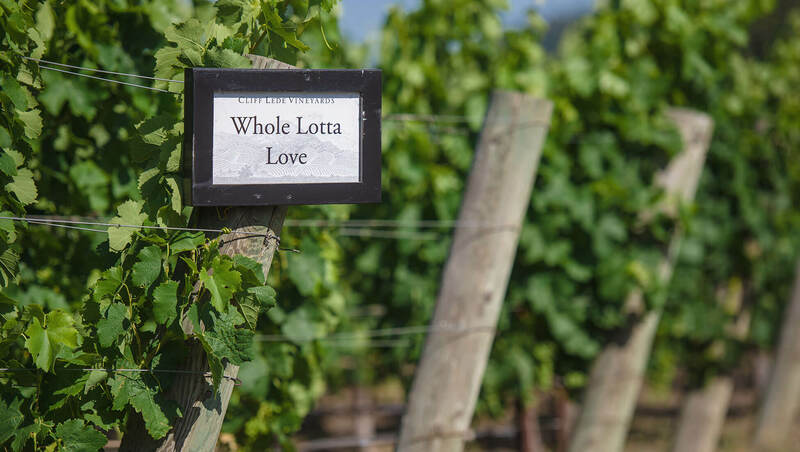 Two years later, the Lede Family acquired the Savoy Vineyard, a benchmark vineyard for Anderson Valley Pinot Noir and Chardonnay. In addition to the Savoy bottlings, FEL Winemaker Ryan Hodgins crafts Anderson Valley appellation Pinot Noir, Chardonnay, and Pinot Gris, and a collection of vineyard designate Pinot Noirs from select vineyards within the Anderson Valley and Sonoma Coast. RSVP for the Winery Spotlight Tasting at your local WineStyles location. Join Us For A Tasting Event Featuring Owen Roe! SINCE THEIR FIRST VINTAGE IN 1999, OWEN ROE HAS STRIVED TO PRODUCE BEAUTIFUL WINES FROM SUPERIOR SITES IN THE PACIFIC NORTHWEST. A PLACE WHERE THE FRUIT RIPENS SLOWLY AND FULLY, RESULTING IN EXCELLENT ACIDITY AND BALANCE. GRAPES ARE HAND HARVESTED, HANDLED WITH MINIMAL PROCESSING, SMALL-LOT FERMENTED AND AGED IN FRENCH OAK BARRELS. Established in 1999, Owen Roe’s emphasis towards Northwest wines has evolved to showcase the unique terroir within the prestigious grape growing regions of the Yakima and Willamette Valleys. Co-Owners, David & Angelica O’Reilly and Ben & Julie Wolff share a passion and history dedicated to fine wines and together, they have developed a diversified portfolio that has been recognized globally by critics, wine writers and consumers. 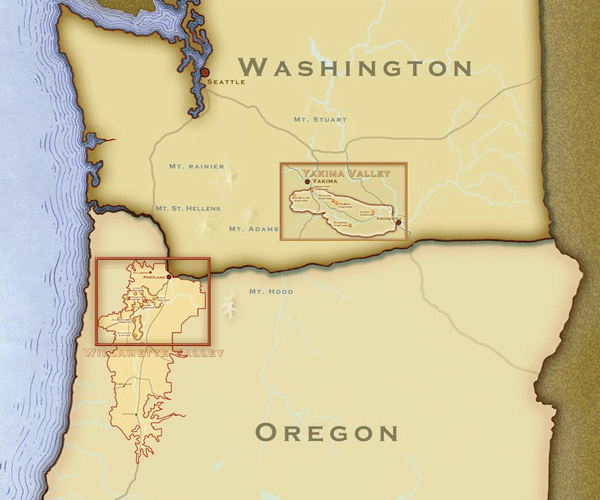 The map below represents the two appellations in which they source and craft their Pacific Northwest wines. The winery is named after Owen Roe O’Neil, a 17th century Irish Patriot who dedicated his life to upholding the highest principles of political equality and freedom. Owen Roe winery shares his dedication to principle with meticulous attention to every aspect of the wine bottled. Using minimal handling and traditional techniques, Owen Roe uses organic materials in the wine making process and no herbicides or pesticides used in vineyards. Winemaker David O’Reilly, originally from Ireland, has been working with wine for over 20 years. He first developed interest in wine while attending college in California. After graduating, he began working at a small winery in Santa Barbara. After a few years, he was drawn to Oregon to work at Elk Cover Winery. In 1994, he joined forces with Peter Rosbeck to make wines under the Sineann label and shortly thereafter formed Owen Roe Winery. Over the last 10 years, David has worked to pioneer winemaking in the Yakima Valley AVA. This region presents the new world with an outstanding opportunity to create old world, right bank style wines. David is able to harvest fruit that best translates naturally into his signature style, wines with deep fragrance and lush flavors balanced by elegant structure. 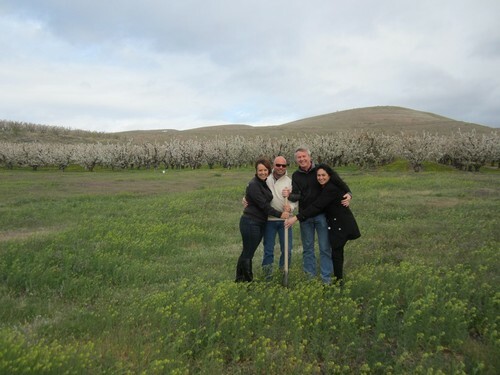 Pictured below, owners Julie and Ben Wolff (left) and David and Angelica O’Reilly (right) are shown breaking ground in Union Gap for their new winery in 2013.